(Newser) – Doctors opted for an emergency cesarean section at 24 weeks' gestation after discovering the fetus wasn't gaining weight. 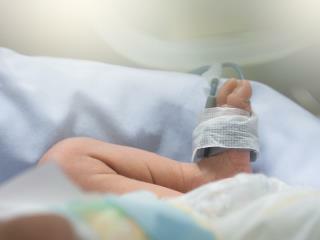 The baby boy weighed 9.45 ounces at his August birth—and has survived, making him the smallest baby boy ever to do so. The BBC reports the baby was discharged from Tokyo's Keio University Hospital Feb. 20, two months after his due date, after reaching 7 pounds. "I am grateful that he has grown this big because, honestly, I wasn't sure he could survive," the boy's mother tells Reuters. The BBC describes him as small enough to be held in a pair of cupped hands (see photos here). Some states are now allowing late term abortions, up to the time of a FULL TERM birth... but the Dems ARE worried about separating kids at the border. The governor of Virginia (Dem) explained how Infanticide is done and he's a Children's Neurosurgeon!! I guess the "Hippocratic Oath" doesn't apply anymore either. REALLY puts lie to the Liberal claim that it ain't a kid until a certain amount of time. Not to mention the ludicrous notion that a child isn't human until it is out of the womb. Liberals in this country would have considered this child trash and unworthy of the effort to be saved. A bigger bunch of ghouls have never wandered the Earth. According to Democrats, he is not even a human being. SICKOS!! !